This holiday is perfect for anyone who is dedicated to seeing the Northern Lights and anyone who wants space for some freedom in their itinerary, as all of the activities are in the evening. Some of our best activities are included, like a husky safari, a reindeer sleigh ride, snowshoeing and snowmobiling, but all of them are experienced under the stars and, fingers crossed, the Northern Lights. 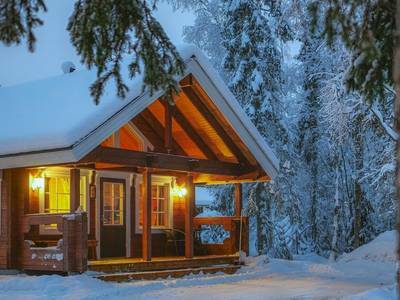 Each activity ends with a hot drink around the open fire, so you can continue to admire the Arctic sky. There are a number of optional activities to choose from should you wish to add to your exciting itinerary. This 7-night trip to Harriniva offers amazing opportunities to see the Northern Lights. You will be husky sledding, reindeer sleighing, snowshoeing and snowmobiling through the Arctic night. This means that your evenings are all about experiencing thrilling activities whilst chasing the magical Aurora. This trip offers the ultimate Northern Lights experience. 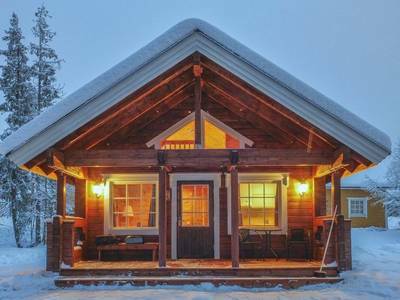 Set in Harriniva, amongst the beautiful fells of Western Lapland and surrounded by the wild, rugged landscape, this is an ideal location for a week of winter activities and Northern Lights hunting. The nights of this trip are dedicated to optimising your chances of seeing the Lights, and each activity that is included takes place in the evening, to ensure that you can combine some spectacular experiences with the magic of escaping the light pollution and chasing the Aurora into the night. You will speed over the fells on a snowmobile, reindeer sleigh ride through the forests and husky sled into the night, all in search of the Northern Lights. Also included in your holiday package is a Lappish foodie experience, a guided snowshoe tour and an evening visit to the Arctic Spa. You will certainly not be bored with the huge variety of Aurora hunting throughout your stay. Routes and distances for your chases will depend on the weather and Aurora activity on the day, heightening your chances of spotting the enchanting Aurora Borealis. The days have been left free for you to tailor your trip to suit your wishes and your budget. 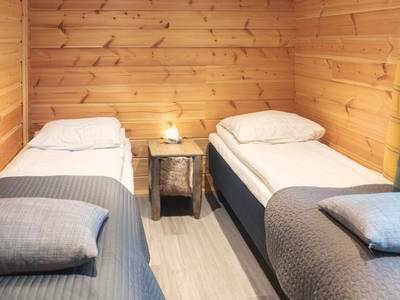 Staying in your cosy accommodation in Harriniva, you can use this time to unwind, utilising your free daily access to the hotel sauna, trying a traditional Finnish pastime while basking in relaxation. 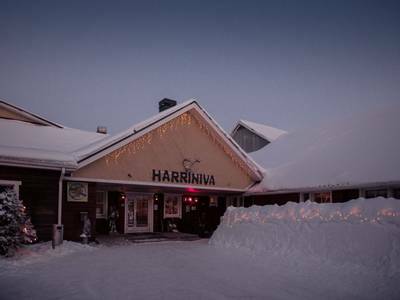 You may want to take yourself out and on to the rolling fells of Harriniva, making use of the day’s snowshoeing and cross-country skiing equipment that is available to you. Or you can choose from the wide range of optional activities that are offered on this trip (see details under the ‘Personalise’ tab). This seven-night holiday promises many one-of-a-kind experiences in a stunning location and the best possible chance of viewing the phenomenal Northern Lights. 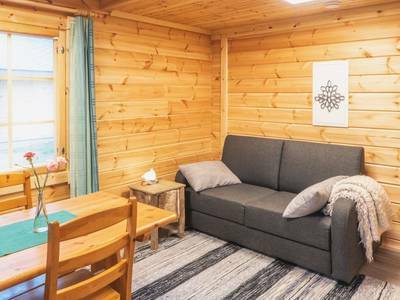 You will arrive at Kittilä Airport and be taken on a one hour transfer to your accommodation for the week at Harriniva Wilderness Hotel. Upon arrival, you will be greeted at reception and given your Northern Lights alarm and your cold-weather clothing. You are free to decide how to spend the rest of your day. 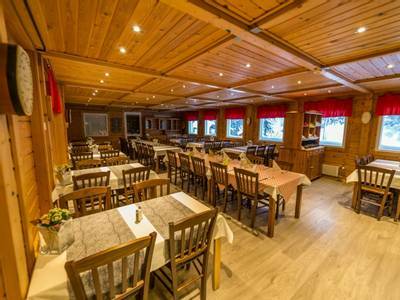 Dinner will be served in the main hotel and you can spend the evening settling into your cosy accommodation. After breakfast, the day is completely free. You might want to book an optional safari or activity (details for these can be found under the ‘Personalise’ tab for this trip). Or you could take yourself over the snowy fell tracks on the available cross-country skis. Lunch will be served in the hotel restaurant. After dinner, it is time to head out and hunt for the lights by snowmobile on an Aurora Adventure. You will drive two per snowmobile (assuming both are over 18 years old and have a valid driving licence). Should there be clouds then the snowmobiles will give you the best possible chance to get to a place where you may be able to see the Northern Lights, should they appear. Hot drinks and snacks will be served at the top of the fell. Today you will have breakfast and lunch in the hotel and in the afternoon, you will join your local guides in a kota to enjoy some delicious snacks around an open fire. The guides will give you information about the hotel, activities and the local area, answering any questions you may have. Then, you will have your ‘Secrets of the Northern Lights’ workshop, where guides will explain the science behind the fascinating phenomenon of the Aurora Borealis. You will put on your snowshoes tonight for your Northern Lights hunt and head out on a peaceful walk through thick blankets of snow and beneath the dark, star-lit sky. Your walk will end with a hot drink and snacks by a toasty fire and, with any luck, the lights will put on a show, dancing and swirling above you. Today, you will eat breakfast and lunch as usual in the hotel, then you will be left to your own devices once again, allowing you to tailor your day to suit your wishes and preferences. 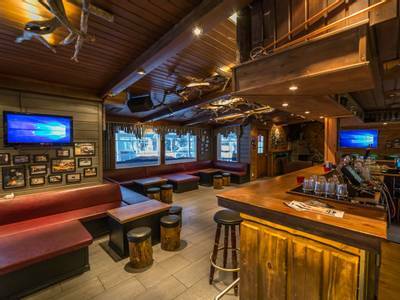 This evening, you will head to a traditional Lappish kota and help your guide to prepare a BBQ over an open fire. Afterwards, the dishes will be served as a three-course meal whilst you enjoy the cosy atmosphere and wait for the Northern Lights to appear. Once again, you will finish breakfast and tailor your day as you wish - you may wish to simply relax and enjoy the hotel sauna. As usual, lunch will be served in the hotel's restaurant. After dinner, the adventure continues with an exhilarating night-time husky safari. You will visit the local husky farm to meet the energetic dog team you will be driving during this safari. You will travel with one person standing on the runners at the back of the sledge whilst the other sits and then you will have the chance to swap over. You may be lucky enough to ride beneath the Northern Lights and, once the safari is over, you will enjoy a hot drink and snacks around an open fire while you keep warm and keep a lookout for a display. After breakfast and lunch, you will enjoy another free day, so you can decide how you would like to spend it. If you enjoyed your husky safari last night, you could spend your morning on an even longer, 25km safari, with one person per sled, rather than two. 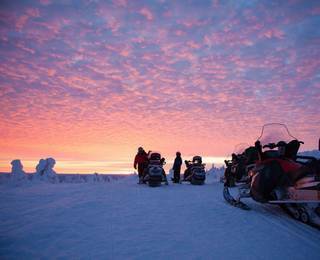 Or, you could have another try at snowmobiling and book the snowmobile panorama safari, which takes you through the collection of fells around Harriniva. Dinner will be served as usual and your next hunt for the Northern Lights will begin – this time, via reindeer sleigh. 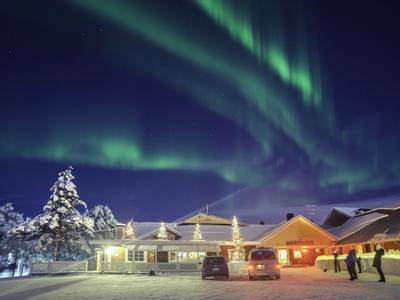 You will visit the local reindeer farm, where you will begin your quiet and peaceful sleigh ride through the enchanting forest, gradually arriving further and further away from the light pollution and enhancing your chances of seeing the Northern Lights. 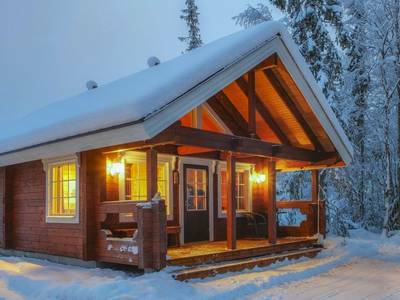 On your return, you will enjoy hot drinks and snacks around the fire, as you gaze at the stars and potentially continue to appreciate the mystical Aurora. Following breakfast, this is your final day to choose from a number of spectacular activities. You may decide to try the national obsession of ice fishing, a relaxing and rewarding activity – particularly if you make a catch. Or, you could learn more about the indigenous Sámi community on a Sámi Culture day, visit a local museum and have another chance to experience a reindeer sleigh ride. This evening, you will be served a special farewell dinner, which will consist of local Finnish delicacies. You can enjoy the delicious meal and reminisce about the past week that is now coming to a close. After dinner, you will head to the Arctic Spa in Jeris, approximately 30 minutes away. 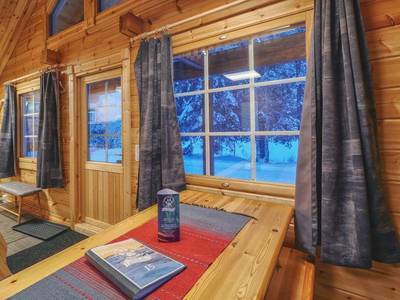 Here, you can unwind in the traditional saunas and for the brave, take a dip in the icy lake. The Northern Lights might even be there to bid you farewell! This morning, you will have breakfast and bid your holiday farewell as you are transferred to the airport in time for your flight home. Owned and run by the Pietikäinen family, the hotel has developed a growing reputation for its warm ambience and a large range of enjoyable activities on offer. 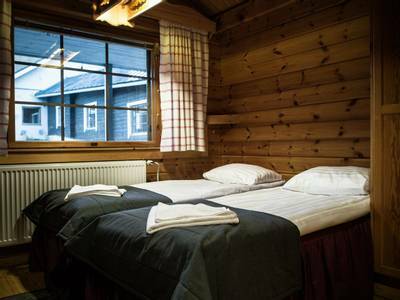 Harriniva has 64 guest bedrooms which consist of twin or double rooms. Triple rooms are also available on request. 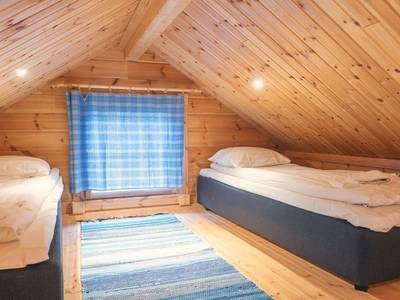 Decorated in traditional Scandinavian style, all rooms have an en-suite shower room and a hairdryer. 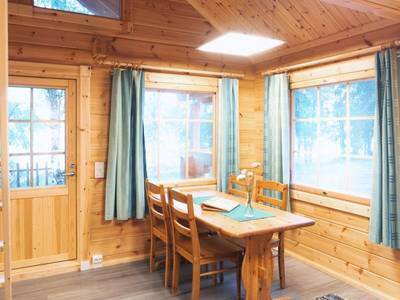 The hotel has a small number of cabins available on the riverbank, which offer a more secluded accommodation option. 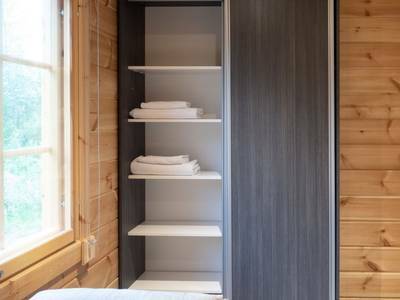 The cabins have double or twin beds, a private sauna, an en-suite shower room with a hairdryer, a small kitchen and a lounge area. 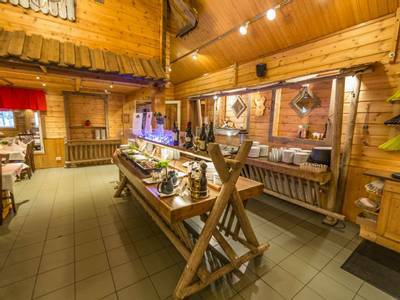 For those travelling on our longer husky or snowmobile experiences, your nights at the hotel will be spent in shared accommodation in one of Harriniva's Safari Houses. Each has sleeping facilities, a shower room, toilet and a sauna. Some safari houses are on site, whereas others are located 3km from the hotel. If you are staying off-site, you will be transferred to and from the hotel for meals. 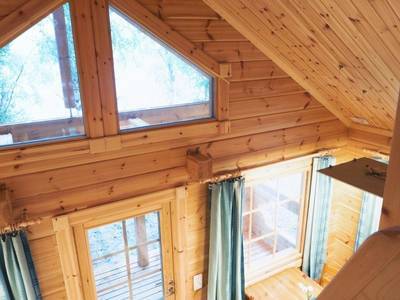 Built in summer 2018, these new cabins make the perfect cosy winter escape. 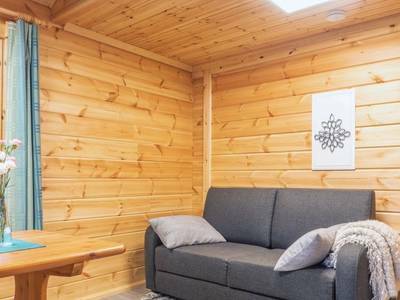 Set in a picturesque, riverside location and ranging from 39m² to 47m², Harriniva’s Riverside Cabins are ideal for larger groups, or those wanting a little more space and privacy during their trip. 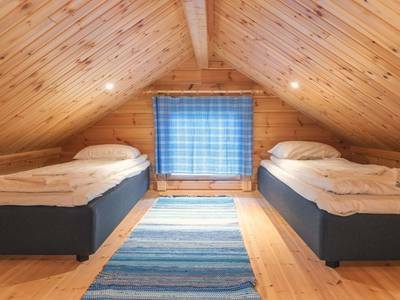 Each cabin sleeps five people in total, with a main bedroom for two people, a loft area (accessible by a steep ladder) sleeping a further two people and a pull out sofa bed in the lounge. 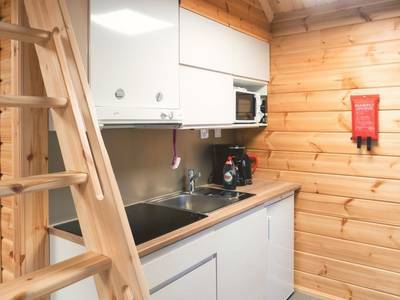 Fully-equipped with kitchen facilities, including a stove, dishwasher and fridge, and with a cosy living room, you can relax and enjoy your own space in complete comfort. 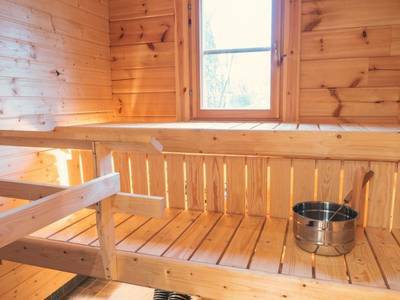 Each cabin even has its own private sauna, perfect for keeping warm after a long day out in the cold. 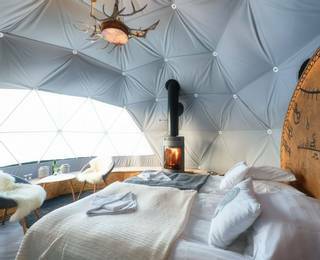 The remarkable Aurora Domes are situated at both Torassieppi and Jeris, a location just a short transfer away, and offer a unique experience for overnight guests. 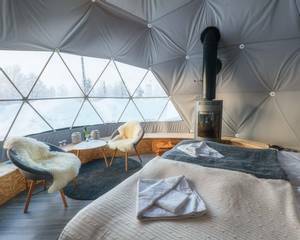 These dome-shaped tents are filled with cosy features and are simple in style, with fantastic views looking out to the frozen lake beyond. The domes have been designed so that one wall is see through and therefore provides views of the night sky and, with luck, the Northern Lights. The domes are equipped with a double bed and a wood burning stove, as well as an electric heater. Although the stove and heater will keep the dome in a warm state, we do recommend keeping additional layers to hand, in case you find yourself in need of extra warmth should the fire burn out. 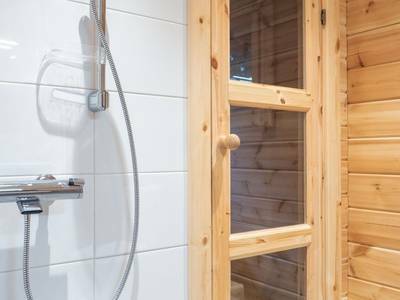 The toilet, shower and sauna facilities are located a short walk away (50-100m, approximately). Clients may be allocated to either destination on arrival. Any required transfers and breakfast are included. 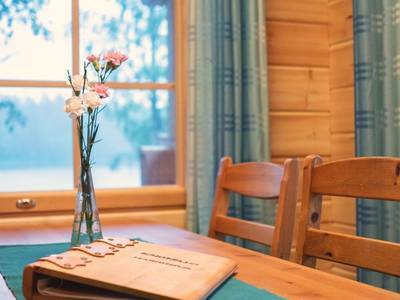 For December dates at Torassieppi, you will have dinner at your hotel, prior to transferring to your dome at approximately 8:30/9pm; from early January onwards, you will check-in at approximately 4 pm and have dinner at Torassieppi. If you are staying at an Aurora Dome in Jeris, check-in is approximately 4 pm throughout the season and you will have dinner at Jeris as well. At both locations, you will check-out after breakfast. Please note: the price shown is based on your spending the first or final night of your stay in a dome and therefore not requiring a hotel room or cottage. Should you wish to spend an alternative night glamping then additional supplements will apply. Please contact one of our team for a quote. Say hello to the friendly huskies at the Arctic Sled Dog Centre and pick up the art of driving a dogsled. You will then test your skills on a nine-kilometre trail. Travelling two people per sled, you will have the chance of swapping the roles of driver and passenger halfway. 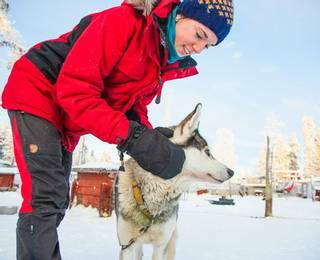 This is activity is ideal for those who wish to get a taste of dogsledding before going on a longer husky safari later in their holiday. You will be out for around one-and-a-half to two hours. Reaching the Arctic Sled Dog Centre, you will receive full instructions on how to drive a husky sled before heading off on a 25km husky safari, going one person per sled. This adventure will give you a real sense of the trail, as you will be out for around four to five hours. 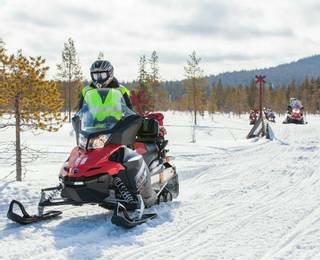 This is the ultimate one-day snowmobile safari, covering a total distance of 80 to 100 kilometres, with a stop for hot drinks and a picnic lunch. You will drive your own snowmobile and will be out for between five and six hours. You must be over 18 and hold a full driving licence to drive a snowmobile. Available: On request and subject to availability, a total of 4 participants are required in order for this trip to operate. A national obsession in Finland, ice fishing is a must-try activity in this part of the world. You will be taking to a local fishing spot on a frozen lake. Here, you will be shown how to drill through the ice and arrange a line. As you wait for the fish to bite, you can take in the scenery with a hot drink in hand. You will be out for around two hours. You will receive full instructions from the Arctic Sled Dog Centre on how to drive a husky sled. 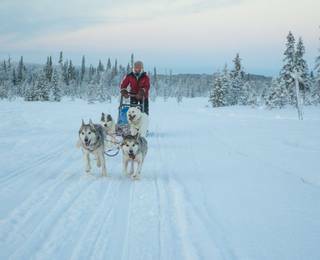 You will then head off on a 17km husky safari, travelling two people per sled. This is an ideal safari for those who wish to try out a longer dogsledding experience with the chance to switch between driver and passenger. You will be out for about 2.5 hours. Cross-country skiing is a much-loved activity in the Nordic Countries. Training in the basics will be provided, so it is an ideal session for those who have never tried the sport before. You will be out for around two hours. The Sámi are Lapland’s indigenous people, and their culture can be appreciated throughout the region. On this activity, you will head to a local reindeer farm and find out about the Sámi herder’s way of life, help feed their animals and take a tour of the on-site museum close by. This is one of the oldest farms in Finland, welcoming visitors from all over the world. An enchanting reindeer sleigh ride is included, followed by lunch in a ‘kota’, or traditional Sámi tent. 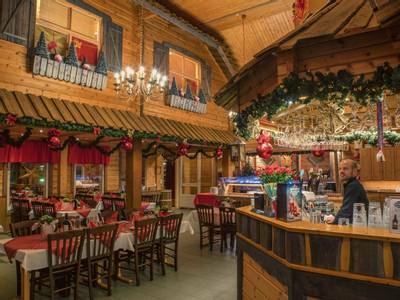 From late December, you will then enjoy a tour of the nearby Torassieppi Winter Village which features snow rooms, ice sculptures and a very cool restaurant! You will be out for around three to four hours including transfers. This safari lets you get familiar with the surrounding region, taking you through the fells around Harriniva. Travelling two people per vehicle, you will have the opportunity to swap the roles of driver and passenger during a break on the way. Anyone wishing to drive must have a full driving licence and be over the age of 18. The total distance covered will be around 30 kilometres.